The amount of energy required to heat structures throughout a long, cold winter can be staggering. Countries and regions with especially cold climates often have much higher annual per capita energy consumption than areas with milder climates. Due to their sheer size, commercial buildings contribute greatly to this energy burn. For instance, in Canada, known for its cold climate and long winters, commercial buildings account for about 53 percent of the total national electricity consumption and roughly 28 percent of the nation’s greenhouse gas (GHG) emissions, according to the National Science and Engineering Research Council of Canada (NSERC). As Canada and the United States take steps to become more energy efficient and eco-conscious, figures like these are most definitely an area of concern. High energy consumption burdens power grids and contributes to air pollution through greenhouse gas emissions. Typically, this excessive energy consumption can be traced to inadequate thermal control strategies in building envelopes, which allow the loss of heated interior air. The flow of heat into and out of a building in hot and cold seasons is an important factor in determining its overall energy consumption, operating cost and occupant comfort. Heat naturally tends to flow from an area of high temperature to one of lower temperature in buildings. In cold weather, for example, thermally inefficient buildings are likely to lose heat to their colder exteriors. The bigger the temperature difference, the more the heat will flow through the wall assembly. With ever-increasing fuel costs and growing support for environmental conservation, many building owners are working to reduce energy consumption by making improvements in energy efficiency. A good first step toward this goal is incorporating appropriate amounts of thermal insulation into the wall assembly. One of the best ways to impede natural heat flow and air leakage through walls is to place obstacles in their paths. This process is referred to as “breaking the thermal bridging.” Thermal bridging is the path between the exterior walls and interior walls; it offers smooth passage for heat transfer and air leakage in poorly insulated buildings, usually built from concrete and metal — materials that offer inadequate heat flow resistance between the outside and the exterior walls. The main material used to break the thermal bridging is thermal insulation. Commercial thermal insulation options include cavity insulation, which occupies space inside the wall cavity, and insulating sheathing, which is installed over the exterior walls. Placing the sheathing in this location provides a thermal break between exterior walls and the outdoor environment. When the exterior finish does not allow for exterior insulation, the installer should attach continuous insulation board to the inside of the wall. The thermal performance of insulation materials is gauged by their resistance to heat flow. Material performance can be rated according to thermal conductivity (k), thermal conductance (C) and thermal resistance (R-Value). When measuring the thermal properties of building materials, the standard is ASTM C518, in which a heat flow apparatus measures heat transfer through homogeneous materials, such as insulation. The temperature, heat flux, area and thickness data retrieved from this test can determine several material properties, such as thermal resistance, conductance and conductivity. The National Research Council of Canada (NRC), through its extensive testing programs, has proven that reducing air infiltration into building cavities actually improves the thermal effectiveness of thermal cavity insulation. Some building codes and energy conservation programs now require air leakage testing to be done in buildings prior to occupancy. Fiberglass insulation has for many years been the most common and practical insulation choice for commercial building applications, since it has a lower installed cost than many other types of insulation materials. For equivalent thermal resistance, it is generally the lowest cost option when compared to cellulose or spray polyurethane foam (SPF) insulation systems. In addition, it has a high level of recycled content, is moisture resistant and noncombustible, and provides superior sound absorption. Few insulation materials perform so well in all of these areas and are still reasonably priced. 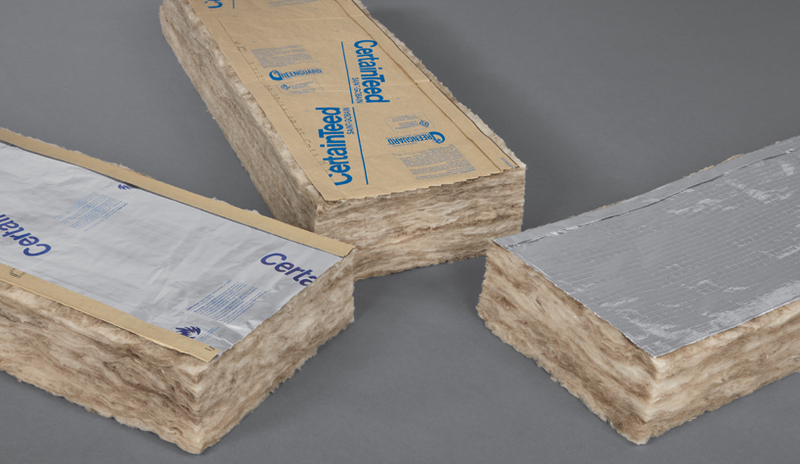 Fiberglass insulation is available in rolls or pre-made pieces, known as batts, with specific R-Values ranging from R-8 to R-40, and offers thermal design flexibility for specifiers. If they add fiberglass insulation in certain sections of a building, they can increase overall thermal efficiency and make up for areas with lower thermal values, such as windows and doors. 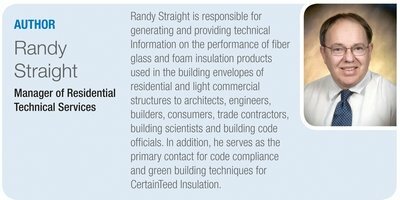 With its wide range of available R-Values, fiberglass insulation gives architects more options for meeting energy code requirements. When properly installed, it offers lasting thermal performance; it is inert and does not settle, thus maintaining its R-Value over a long period of time. Ensuring that a building is properly insulated is an excellent investment in thermal efficiency. When teamed with air barriers and appropriately sized, ENERGY STAR® qualified HVAC systems, insulation is also a strong factor in improving the overall energy efficiency of a building. It helps minimize the loss of valuable heat during the winter, which reduces utility costs for building owners, conserves nonrenewable fuel sources used in heating, lowers greenhouse gas emissions and makes interior spaces more comfortable for occupants. Thermally efficient buildings benefit individuals, our national power grids and, most importantly, our environment. Installing more thermal insulation in wall cavities for higher R-Values is one of the easiest, most economical ways to reap these benefits.